The Offline NT Password & Registry Editor password cracker is one of the fastest free Windows password recovery tools we've used. You might even prefer this tool over any premium password recovery program we've tried. In a Hurry? Skip the review below and head right to the complete step-by-step guide to Offline NT Password & Registry Editor. If you can follow some easy instructions, and type a few numbers on your keyboard, then you're already more than able to hack in to your Windows computer with this free software. Once it's done, you'll be able to access Windows without a password at all! Continue down to the How to Use Offline NT Password & Registry Editor section for easy instructions, or check out that step-by-step tutorial linked above. This is one of the better password reset tools available for Windows, as you'll see. Offline NT Password & Registry Editor can delete any password from nearly any installation of Windows almost instantly. No installation in Windows is required making this program an easy alternative to many other password recovery tools. Offline NT Password & Registry Editor simply deletes passwords instead of displaying them making it fast and easy to use. Offline NT Password & Registry Editor is completely free to download and use. Resets Windows 10 & Windows 8 passwords (local accounts only, not Microsoft accounts). Resets Windows 7, Windows Vista, and Windows XP passwords. Offline NT Password & Registry Editor will also remove passwords from 64-bit versions of Windows. Offline NT Password & Registry Editor (2014-02-01 Build) is an amazing password recovery tool but instead of actually recovering your Windows password like Ophcrack and similar tools do, it deletes it. Without a password, you're allowed unrestricted access to your Windows operating system. Offline NT Password & Registry Editor requires a little preparation but is very much worth the effort if you've been locked out of your Windows PC! Below is a quick how-to for Offline NT Password & Registry Editor. However, we highly recommend this step by step guide with screenshots if you're not familiar with Windows password recovery software and need a more detailed walkthrough. To begin, visit the Offline NT Password & Registry Editor website and then scroll down to the "Download" section near the bottom of the page. Download the cd140201.zip file — the one described as the "Bootable CD image." This ZIP file is only around 18 MB so it'll be a quick download for most of you. Choose the "CD" download even if you plan on putting ONTP&RE on a USB drive. Do not choose the one labeled as "Files for USB install." More on this below. Once downloaded, extract the ISO file (cd140201.iso) from the ZIP file. You can do this using the built-in extraction tool in Windows, or you can use a free file extraction program like 7-Zip and do it that way. Burning the Offline NT Password & Registry Editor ISO image to a disc is probably the best way to go if the computer you're using now, and the computer that you're trying to erase the password from, both have an optical drive. Feel free to use whatever method you're used to to burn the ISO file to a disc. If you've never done this before, please know that burning an ISO file is different than burning a normal file! If you need help please see How to Burn an ISO File to a CD. After the disc is created, boot from it on the computer that you're resetting the password on. This is usually done by restarting the PC with the disc in the drive. Offline NT Password & Registry Editor will start automatically. If Windows starts instead, or something else goes wrong, See How to Boot From a CD or DVD for a tutorial and some troubleshooting tips. If the computer you're working from, or the computer that needs the password reset done, doesn't have an optical drive, you're left with having to get ONTP&RE working from a flash drive. There's nothing wrong with doing it this way, so feel free to choose the USB drive method, even if you just prefer to. As you may have read above, burning an ISO file is different than just burning or copying the file. The same goes for getting an ISO file to a USB drive. In fact, it's even a bit more complicated. Even if you've done this before, I highly recommend following my How to Burn an ISO File to a USB Drive, which I know for a fact works great with the cd140201.iso image you just downloaded. The ONTP&RE site has a different download and method for getting their software working from a USB drive but I find their procedure much more difficult to follow. The tutorial I just linked you to is much more automatic and foolproof. Now that you've created an Offline NT Password & Registry Editor USB flash drive, boot from it to get the process started. 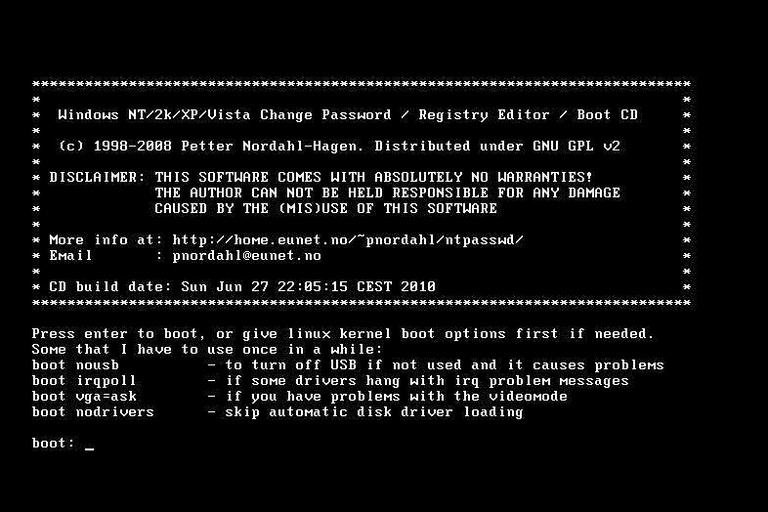 See How to Boot From a USB Device if you have issues or if you're new to this. Once Offline NT Password & Registry Editor starts, either from a USB drive or from a disc, just follow the instructions given on screen by the program. Most of the questions default to their appropriate answers and what options do exist are pretty self-explanatory. When Offline NT Password & Registry Editor finally deletes your password, remove the disc or flash drive from your PC. Reset your computer and log in as you normally do, but do not enter anything in the password field. You're in! Once Windows loads, create a new Windows password that you can remember and then create a password reset disk so you never have to use this program again! Having Problems Using Offline NT Password & Registry Editor? Did you have problems running Offline NT Password & Registry Editor or did it not delete your Windows password? Try another free Windows password recovery tool or maybe even a commercial Windows password recovery program. Also, be sure to check out my Windows Password Recovery Programs FAQ for answers to the most common questions I get about these tools. If you're not having much luck with Offline NT Password & Registry Editor, see our Ways to Find Lost Windows Passwords piece for all your options.